When concepting ideas for TGG’s dining space I wanted to celebrate doing good while getting visitors to interact. 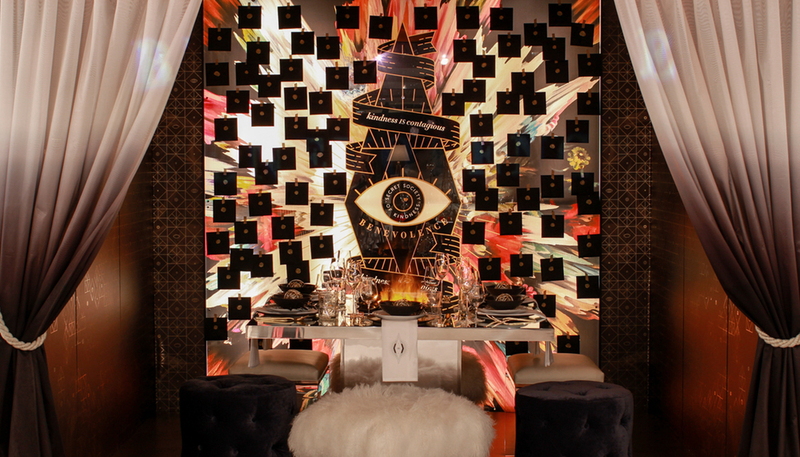 To push the dinning experience, the idea of a secret society stood out to me as something unexpected for Diffa. I was intrigued that secret societies have an “initiation” to join, and provide a feeling of being exclusive among a group of people (communal). 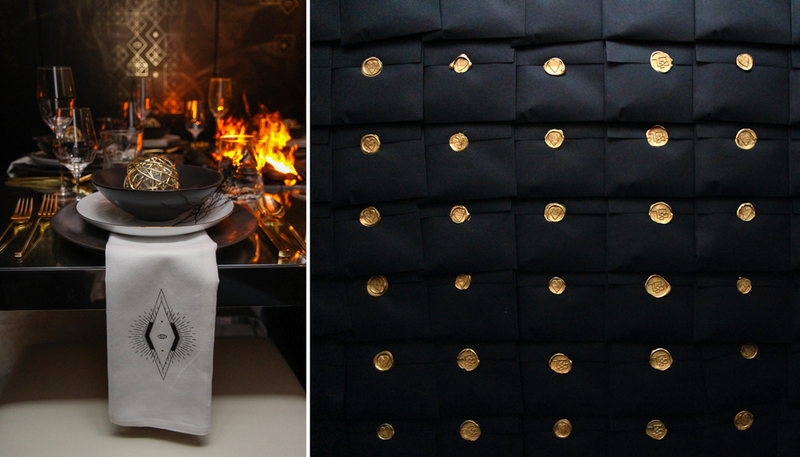 We named our dining concept Benevolence: The Secret Society of Random Acts of Kindness. Visitors entered the booth through smoky ombre curtains, revealing an artificial fire placed in the center representing the age-old communal tradition of gathering around a fire. I designed the wall-covering to have a modern spin on hieroglyphics with abstract smoke weaving behind to create more depth. Visitors to the booth were encouraged to select an envelope off the back with an act of kindness assigned inside. Acts of kindness varied from "send a group selfie to a friend," to "strike up a conversation with a stranger." After completing said act of kindness they were now part of the secret society and could wear a custom lapel pin noting their membership. The pin also served to pique the curiosity of attendees while rewarding those who were willing to participate. As more envelopes were removed from the back wall, artwork that was back-lit with messaging was revealed. View the space transform here. Dining by design, otherwise known as Diffa, brings together designers and local talent to create dining installations that inspire and delight. Typically designer partner with manufacturers and vendors to design something that showcases each participants capabilities while giving back to the community. These extraordinary dining environments, set the stage for two days of fundraising at Chicago's Merchandise Mart. For 2015 the theme was communal. To create a cohesive and truly memorable dining experience, in order to differentiate The Gettys Group's dining booth from the others showing during Diffa Chicago 2015.